Mark Zuckerberg likely never imagined this when he founded Facebook as an undergraduate in his Harvard dorm room. The website he created as a social network for college students is now the site of a brewing battle between two centenarians over who can lay claim to being the oldest among Facebook's more than 1 billion monthly users. 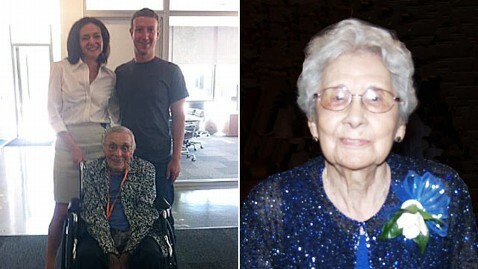 Logged on in one corner is Florence Detlor, the 101-year-old Californian who, in August, was designated Facebook's oldest user by Zuckerberg and Facebook COO Sheryl Sandberg. Detlor traveled to the social network's Palo Alto campus for a personal tour. In the other corner is a New Mexico woman, Maria "Mary" Colunia Segura-Metzgar, who just celebrated her 105 th birthday on Tuesday and has her own Facebook page, complete with 86 friends. Segura-Metzgar, however, is so far removed from the typical Facebook user that she had to shave a few years off her age in order to join the site, according to her 60-year-old grandson, Anthony Segura, who is responsible for signing her up. "I tried to sign her up on Facebook a few months ago but it wouldn't accept her birth date," Segura told ABCNews.com today. "Then I tried again and just put in 101 and it accepted it for the timeline, even though she was 104." "Now on Facebook it says she's 102 when, in reality, she's 105," he said. Segura, who said his grandmother is too hard of hearing to be interviewed by phone, said he has tried to reach Facebook to rectify the problem, but they have been unresponsive. A call placed to Facebook by ABC News was not returned as of this writing. Even though the title would be nice, Segura says it was a much more important reason why he got his grandmother to join Facebook. "We want to let everybody know in the family that she's still alive and kicking," he said. Segura-Metzgar, known as "Grandmother Mary" to her nearly 40 grandchildren, "too many to count" great-grandchildren and two new great-great-grandchildren born just this week, lives just a few miles away from Segura and his wife, Mayra, in Albuquerque. They visit her frequently to let her use their iPad to log on and update her page, most recently with photos from her 105 th birthday party. "She's still very sharp and likes to tell stories of her life and we wanted to be able to record her life as a legacy," said Segura. "We're a very large family and there's a lot of stories that a lot of the family doesn't know and we wanted to be able to capture those. Since 'Timeline' came out we thought it was a good idea to put those [stories] on Facebook to have a timeline of her life." Segura is also tasked with keeping his grandmother's friends list to just family and friends, no small task considering he had to deny more than 50 friend requests just Wednesday from curious onlookers. That same fate befell Florence Detlor, Segura-Metzgar's younger competition, who, after her personal visit with Zuckerberg and Sandberg was made public, had too many friend requests for the site to process new ones. Segura-Metzgar, a twice-widowed mother of four, is one of 10 children whose 99-year-old and 97-year-old sisters and "a couple brothers" are still alive, according to Segura. While she is the only one of her siblings to take on the World Wide Web, Segura-Metzgar hasn't given up on the old-fashioned way of getting her news and staying in touch either. "She loves to watch TV and read the newspaper, she's always done that all her life and she still does it to this day," Segura said. " She's very involved in politics. She won't tell us who she's going to vote for but she will be voting."